Just Got A Whole Lot Easier!" You start flipping through that dusty collection of cake decorating books sitting on your shelf, but the answers you need aren't close at hand. Quickly jumping online, you attempt to search through every cake and cookie decorating website looking for an answer. An hour later and all you've come across are bakery ads, three identical recipes to oatmeal cookies, and confusing instructions on how to make a cow wedding cake. At this point you're probably feeling the same stress and frustration shared by countless other cake and cookie decorators, both beginner and professional. But those places can often make you feel like you're getting nowhere fast. You're not alone. Like you, we've spent more time than we care to admit browsing through cake decorating websites. It's not only time consuming, but really frustrating. You have to visit one website to learn where you can buy your supplies. 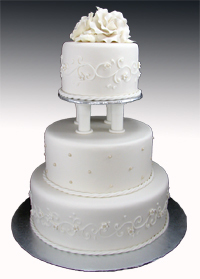 You have to visit another site to find instructions on how to make different types of icing. Then you email several websites hoping someone experienced will tackle your questions. And how often have you been offered detailed instructional videos you can watch online right away? Just imagine. No more endlessly searching the internet. No more waiting for answers that may never come. No more falling behind. The work has already been done for you. Get the answers you need right now. 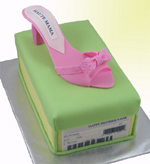 Keep all of your cake and cookie information stored in one convenient place. Award-winning cake and cookie decorators on-staff. Full email support for questions and video requests. We also have cookie designs, candy, and seasonal items. It's not just cakes. Whether you're a working cake decorator or struggling to get started, this website is designed specifically for you. Until recently, it just wasn't possible. In the past, it would cost a website owner hundreds of dollars every time a customer decided to watch their online videos. Thanks to recent advancements in internet technology, it's now possible to provide step-by-step, online videos for a reasonable cost. Anyway, who would have the time to build such a website? A project of this size would take years to develop. 1) A paid, full-time staff of professional cake decorators ready to answer questions. 2) Produce and create step-by-step, instructional videos month after month. 3) Create the world's first cake decorating search engine compiled from 1000s of questions and answers from real people over the world. 4) Pay costly bandwidth so your members can watch the latest videos anytime day or night. That's what we always wanted in a cake and cookie decorating website. For the past two years, we have been answering questions from cake and cookie decorators who couldn't seem to find the answers they needed anywhere else. We were very surprised to learn that is was so difficult to find the right answers online even if you knew where to look. We couldn't find such a website, so we built it ourselves. What's Included With Your Monthly Membership Fee? Over 100 Step-by-Step "How To" Videos available to all member 24 hours a day, 7 days a week, from the moment you join. Free Step-by-Step How-to Videos added to your Library every month! A fabulous forum, full of enthusiastic members who share their knowledge and experience. Members learn about all new cake, cookie and candy products before anyone else. ... and our weekly Video Newsletter will keep you up-to-date on the cake and cookie decorating and candy making world! "I can't even begin to tell you the great satisfaction I have received since being a part of this membership. Every aspect is MORE than what I expect. YOU are the BEST thing that's on the internet. No-way can I imagine being without YummyArts.Com. It just keeps getting better!!!" 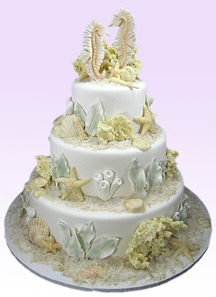 "Since I found YummyArts, I have fallen in love with cake decorating... thanx for everything YummyArts!" I made this cake for a baby shower, and I think it got more attention than the mom to be!! Everyone loved the cake, I got lots of compliments, was told I should go into business, and was even asked if I had a business card!" "My mother-in-law said she was so proud of me, she almost cried!" " I love the information you provide, in just 2-3 months I've easily advanced beyond any beginner level. Last weekend I did a 3 tier fondant cake that sold for almost $200. Thanks so much, it's going really well. "The cookie bouquets were quite a hit, I sold several of them at Christmas. My customers came back saying how happy their hairdressers were with their gift and how delicious they were. Thank You!" First of all, there IS NO other membership site like this! But, let's just think about this for a minute. How much is it really worth to you to save hours of valuable time and resources? 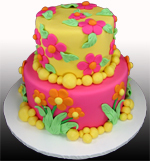 How about quickly receiving your answers from a full-time staff of professional decorators who are eager to assist you in your cake and cookie decorating projects? What is it worth to have access to an ever-growing library of step-by-step cake and cookie decorating videos made from member requests? And if you tried to learn the professional techniques that separate ordinary cakes from jaw-dropping masterpieces through sheer trial and error, how long would it take? Months? Probably even years? And how many costly mistakes would you make along the way? Well let me just say it would take a very long time to put together a cake and cookie decorating resource of this magnitude. We should know. We've spent several years and more money than I care to admit learning the tricks of the trade. YummyArts.com is the result of countless requests from decorators like you, not to mention the amassed experience of a team of professional decorators who have long since graduated (with honors) from the Cake and Cookie Decorating School of Hard Knocks. JOIN RIGHT NOW ONLY $19.95! There's only one type of member we want to have, and that's a happy subscriber of YummyArts. Our members' satisfaction is our highest priority. This is, and will remain our mission. 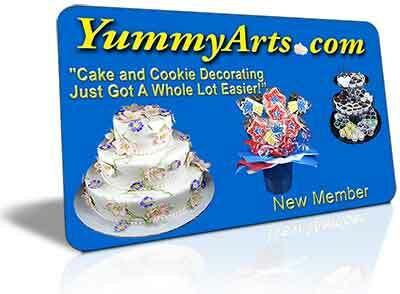 YummyArts is the personalized, professional support system you've been waiting for.